I wanted to make absolutely sure my gauge is identical on the left front and right front (I'm bad at that), so I decided to at least start knitting them at the same time, on the same needle. I've got about 3 repetitions of the twisted rib pattern down and it's not as much of a pain as I thought it would be. 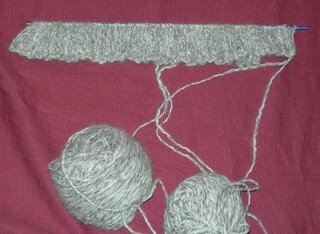 I did have a little "oops" where I realized, about 5 rows too late, that I'd cabled one of the stitches the wrong way. Somehow, I managed to unknit just those stitches and fix it to my satisfaction, without having to rip back 5 rows. I have had several of those oops! moments Malia, when the gap between the cables gets to the same size as the gap within the cable, then if I am tired I have several times done a cable the wrong way. I'm going to knit the sleeves both together, I think, to make sure they are identical. It's probably very prudent to do the fronts like that too.